This month, writer and photographer Ciara Nolan shines a spotlight on Frome fashion designer, matchmaker and hopeless romantic, Truly Sopel. “Herein lies a tale of two cities, inspiring young entrepreneurship, the challenges of living in a small town and an eureka moment that might well help hundreds, maybe even thousands of lonely hearts out there,” says Ciara. “You’ll know if you’ve encountered Truly about town. She’s a universally liked person, one of those quirky, true originals with an effervescent sense of humour and a twinkle in her eye that can signal the arrival of another ‘Truly’ great idea. When I got wind of her latest brainwave I thought I just had to write about her and her idea on the page. “I’ve known this particular fashionista firecracker for nearly a decade, since the day she returned to her hometown and took Catherine Hill by storm. “She opened her first shop here in 2006 whilst still living and trading in London. 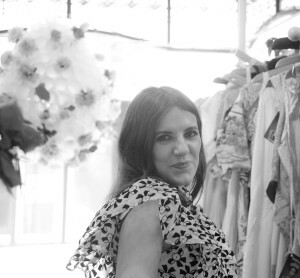 With her ‘Truly Sopel’ fashion brand, she was markettrading queen in Camden, Islington and Spitalfields markets during the week and shopkeeper extraordinaire in Frome at the weekends, a lifestyle pace that would even run the likes of Frome’s own fast lane loving Jenson Button ragged. “Truly eventually moved back lock, stock and barrel to Frome and has traded on the hill ever since – her knicker collection can currently be found in Poot Emporium and the brand has a strong online presence to boot. “Over the years Truly has highlighted (sometimes through hilarious anecdotes) the trials and tribulations faced by an attractive single career woman living in this south-west town. “In short, it ain’t easy meeting likeminded singletons in a town which is attracting young families to its increasingly expensive housing market. “Tutti Frutti Dating has arrived on our doorstep, delivered from the mind of this now happily dating Fromie. Described on the new easy-to-use website and Facebook page as ‘Online dating with a difference, to simply help with your love life’ Truly explains how her new matchmaking enterprise works to address all of the dating problems she and her friends have encountered over the years. “Apart from helping you to find true love online, Tutti Frutti will also be running a series of events in well-known Frome venues, from speed dating to tea meets, there’ll be something to suit everyone. “Frome’s own Cilla also explains that the Tutti Frutti social media pages will go the extra distance and will allow members to review their date and there will be an option to follow the progress of some of the love stories that might potentially blossom. “Truly explains that everyone loves a little romance and that most people just want to see other people being happy, and this is certainly the inspiration behind her setting this service up. I think we can happily declare Tutti Frutti as a Truly good idea! “If you are interested in signing up for any of the forthcoming events please like and share the Facebook page, it may not be for you, but you may have a friend who could do with a bit of a social life.